Being the largest machine in the World, the Large Hadron Collider (LHC) has been an unparalleled source of technological development and innovation as well as a major contributor to our understanding of the fundamental building blocks of the Universe. Now, scientists from all over the World are collaborating to design the accelerator that may replace the LCH once it has completed its operational lifetime. The Future Circular Collider (FCC) will push back the current energy and luminosity frontiers in order to extend the search of new particles and interactions well beyond the LHC. 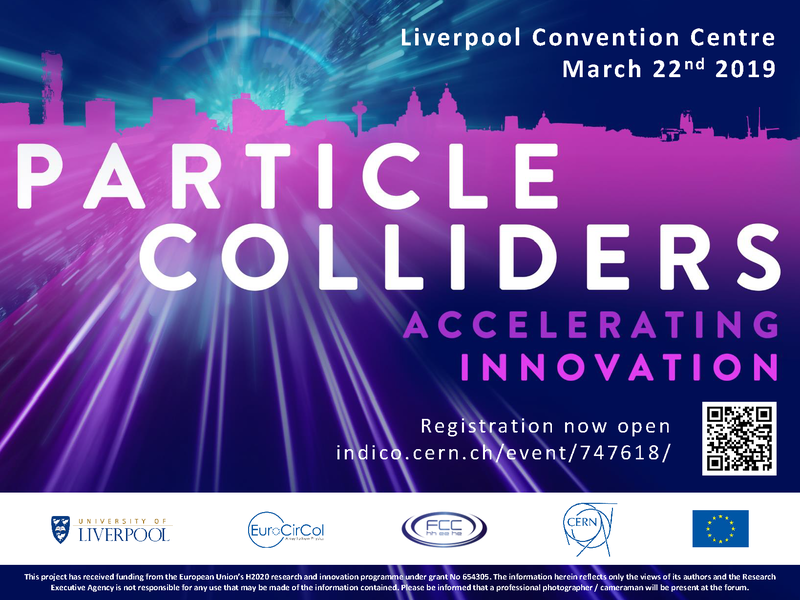 The future of particle physics, advanced accelerator technology, and the opportunities for the industry in the FCC will be discussed at a one-day international Symposium at the Liverpool Arena and Convention Centre, on 22 March 2019. The ‘Particle Colliders – Accelerating Innovation’ Symposium, organised by The University of Liverpool in collaboration with CERN, will be a public display of the FCC study. Talks by keynote speakers about industry opportunities and the future or particle accelerators. Industry exhibition highlighting the latest technologies and market-ready products. Hands-on activities for the general public, including the LHC Interactive Tunnel, and the Tactile Collider. Photographic display ‘The Code of the Universe’. The Symposium will be accompanied by a workshop in the afternoon to explore the opportunities for co-innovation between academia and the industry. The Co-Innovation Workshop will focus on the strategic R&D programme of the FCC, including the technological developments envisaged within the project and the benefits for companies in terms of project involvement and product commercialisation. The workshop will also explore the impact of FCC technologies on other industries, and encourages actively the participation of companies from a variety of sectors like energy, health, security, transport, IT, communications, and civil engineering. Working groups around each of the relevant communities will be formed to discuss specific opportunities for collaboration and funding. The ‘Particle Colliders – Accelerating Innovation’ Symposium offers a unique opportunity to get involved in one of the largest scientific and technological endeavours of the 21st century. Attendance to the Symposium is free of charge but registration is required. Companies wishing to showcase their products can rent a space in the exhibition area for a small fee; sponsorship opportunities are also available. To register and find more information about exhibition and sponsorship opportunities please visit the symposium website. Places are limited. The talks will be streamed live on https://indico.cern.ch/event/747618/page/14628-live-streams.